Heat oven to 350°F (325°F for dark or nonstick pan). Spray bottom and sides of 13x9-inch pan with baking spray with flour. In large bowl, beat cake mix, flour, water, oil and eggs with electric mixer on low speed 30 seconds, then on medium speed 2 minutes, scraping bowl occasionally. Stir in 1/2 cup of the toffee bits. Pour into pan. Bake 34 to 42 minutes or until toothpick inserted in center comes out clean. Cool 5 minutes. In small microwavable bowl, microwave reserved dulce de leche on High 10 to 15 seconds or until softened; spread evenly over top of cake. Sprinkle with remaining toffee bits. Cool about 1 hour before serving. 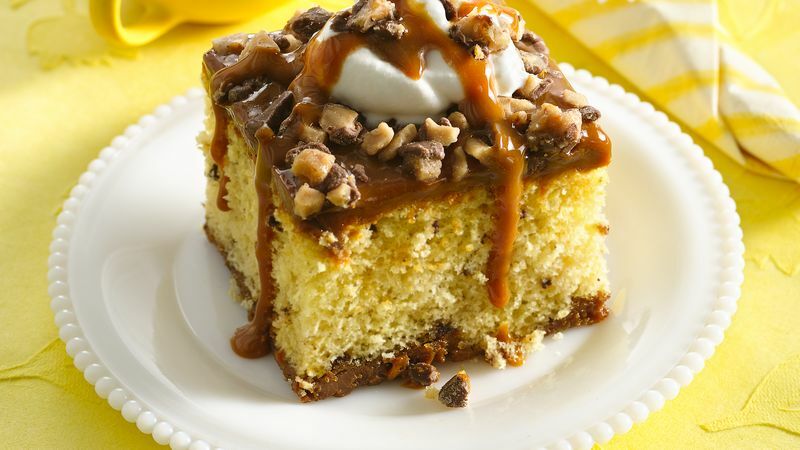 Top each serving with whipped cream and caramel topping.